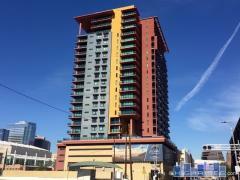 Esplanade Place is one of the most prestigious addresses in Phoenix. Many residences feature fireplaces and large terraces to enjoy the sweeping mountain and downtown views. Building amenities include valet parking, fitness center, 24/7 security, club room, roof-top pool, spa, BBQ areas and more. Have any comments or questions about Esplanade Place? Ask your question and/or share your thoughts about this Building.